Big, brash and gold—I'd say these limited edition HDJ-1000s are the polar opposite of those understated Aiaiai headphones I reviewed, but I think we've all seen a pair of Dr Dre's Beats Pro to know that's untrue. 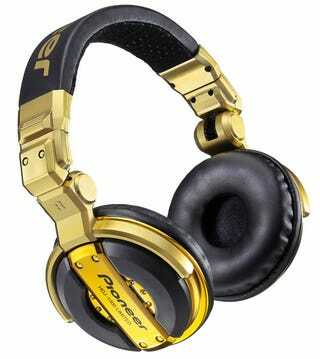 First made available in 2008, Pioneer's not just painted the HDJ-1000s in gold and called it a day. Supposedly they've also fine-tuned the audio formula, with better low-bass frequencies and even clearer playback in the midrange too. They'll go on sale in December for a spot over $200, but if you don't like the gold there's also a rare black model to be had too. LONG BEACH, Calif.—(BUSINESS WIRE)—Pioneer Electronics (USA) Inc.'s Professional Sound and Visual Division today introduced its limited edition HDJ-1000 professional DJ headphones due to be available in December 2010. The limited edition headphones will be offered in two fashionable colors, provide a more comfortable fit, and produce better low frequency reproduction for more effective mixing. "Much like our players and mixers, Pioneer headphones are designed for both style and performance. We have a versatile line-up of headphones that are sure to complement many DJ levels. The new HDJ-1000s will not only catch your eye, but also please your ears," said David Arevalo, senior marketing manager, Professional Sound and Visual Division for Pioneer Electronics (USA) Inc. Many DJs are as critical of the look of their gear as they are with its audio performance. The HDJ-1000 headphones provide the high-quality sound that DJs expect as well as choices of colors and styles that make a fashion statement. The HDJ-1000 headphones come in two new colors, black and gold, in addition to the original chrome model. The black version resonates with a more sophisticated look, while the gold version provides a more glitzy style. Furthermore, the mono/stereo selector circuit was modified to obtain clearer playback, especially in the midrange frequencies. With this change, the headphones deliver sounds such as bass drums, snare drums and cymbals with more impact. The gold HDJ-1000-G and the black HDJ-1000-K will be available in December 2010 at a manufacturer suggested retail price of $209.